iTunes is the primary hub to communicate with an iOS device through a computer. This software is used to sync contents between a computer and a phone, and it works smoothly for the most part. 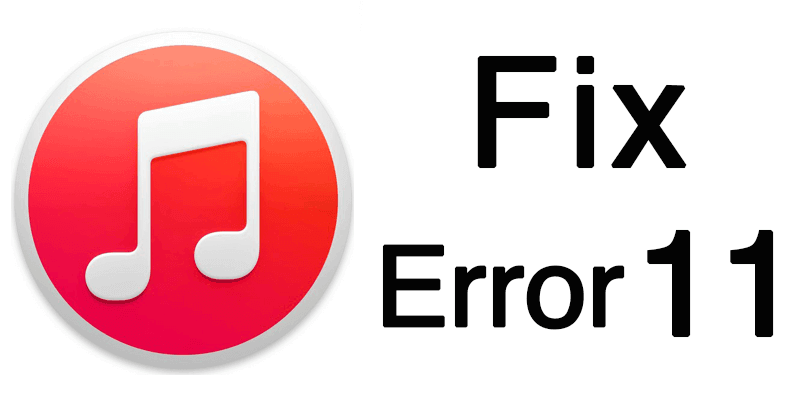 However, iTunes is a sensitive software and once there’s some error on a computer system, there may be unknown errors like iTunes error 11, which is certainly very common. Although this issue is commonly caused by an improper network configuration, yet there may be other reasons. Most of the Apple users can fix iTunes error 11 on their own, with this little help of ours. What causes iTunes Error 11? There’s no definite cause. Apparently, an outdated antivirus program that comes with an even more backdated firewall program blocks the ports required by iTunes to communicate with the Apple servers. Or, maybe the iOS device has a faulty connector port that can’t establish communication unless the connection is in a certain angle. Whatever the reason may be, iTunes unknown error 11 typically causes troubles like being unable to create a backup of an iOS device or restore a backup to an iOS device, sync music to the Apple Music playlist etc. If you are encountering iTunes Error 11, then you may take the measures stated below. It’s more like a trial & error method because the problem can’t be pinpointed unless one evaluates through all the available options. Edit your Hosts File: iTunes error 11 can be resolved by editing the hosts file. Hosts file can redirect the request from iTunes to another server instead to the Apple servers. You will need to edit your hosts file – remove all lines that are containing gs.apple.com, reboot your Computer and try again. Check Anti-Malware Program: Check whether the security program in your computer is providing network access to the iTunes program installed. Due to heavy network activity, a firewall program could block iTunes’ access and as a result, iTunes error 11 might occur. Update iTunes and iOS: Update your iPhone or iPad to the latest available iOS version (make sure you are restoring it with the latest iOS version). If it’s an older generation of Apple device, maybe the latest version of iOS would vary. However, update to whatever latest version is available. Also, update the iTunes version in your computer to ensure the best communication happening between your computer and your iPhone or iPad. Updates to iTunes usually refine the communication process and enhance the data communication speed as well. Update Computer OS: If your iOS device is the latest model and so is the PC you use, maybe it’s time you consider updating to the latest OS you can afford. Restart the device & try again: Very often, the network or connectivity issues are caused by some sort of bugs and they might only take a reboot to resolve. Press and hold down the power button on your iPhone or iPad. A slider will appear, slide to the other side to turn your device off. Once the device powers down, power it on again after few seconds by pressing down the power button for few seconds. Check Port and Battery: Since the data communication takes place using a hardware link, chances are your USB port or the battery connection could be damaged. Take a closer look and assess whether the connector port looks okay. If you have the proper tools and training, you might disconnect and re-connect the battery as well. Conclusion: At least one of the solution above should fix iTunes error 11. If it doesn’t, try a factory reset on your iPhone or iPad.